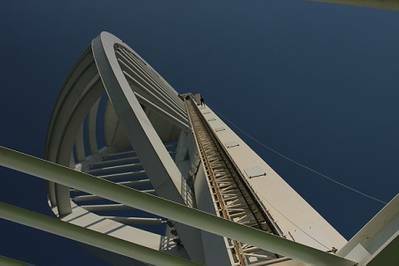 Halyard Marine’s Chairman, James Grazebrook has completed a 170-meter abseil down Portsmouth’s 550-foot Spinnaker Tower. James Grazebrook, founder of South Coast based marine exhaust specialists, Halyard, and four other brave RNLI committee members, Richard Acland, Alistair Groom, Marcus Trinick and Mark Waterhouse joined forces on Saturday, May 25 to take part in the Spinnaker abseil to raise much-needed funds for an upgraded lifeboat station at Swanage. To upgrade the boathouse for the arrival of the new Shannon class all-weather lifeboat, and a smaller D class inshore lifeboat, the project needs to raise £200,000. Together with improved training and changing facilities for the volunteer crew, this will create a state-of-the art facility, securing Swanage into the future. The abseiling team has already managed to break their planned target of £10,000.